Purpose: To review the role of minimally invasive surgery and specifically robotic surgery in management of benign and malignant adrenal disease. Overview: Laparoscopic adrenalectomy (LA) is considered the standard of care for benign adrenal neoplasms and has been increasingly used for malignant disease. Robotic techniques have an advantage in visualizing and dissecting the adrenal and its vasculature. Series of robotic adrenalectomy (RA) and limited comparisons with LA have shown that RA is safe and effective with subjective advantages compared to LA. There has been growing interest in adrenal-sparing surgery using minimally invasive techniques and encouraging outcomes for selected benign lesions. 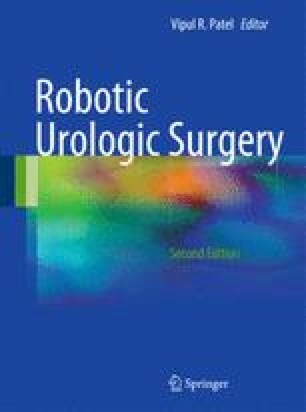 Specific anatomical factors and techniques are discussed to optimize understanding of successfully performing robotic surgery. Summary: Robotic techniques for adrenalectomy have subjective advantages compared to LA, but no objective superiority has been demonstrated. Surgical outcomes have been comparable to LA in most studies but further research and exploration in this field is warranted. RA will be increasingly considered in lieu of LA as robotic systems further disseminate and the cost disadvantages become less burdensome. While LA remains the standard of care, RA is an excellent option in high-volume robotic centers from standpoints of outcomes, feasibility, and cost.